Darrin Gray | Darrin Gray Corp. Sometimes you want to do something a little different with your home. This identifies your property as yours and allows your personality to come forward. Architectural features are a great way to do that. They add a uniqueness to your home that no one else has. Here’s a couple of examples of architectural features that we built for a customer that can really make your home and property stand out. One of the most common repairs that we do is fence repair. This particular fence had a tree planted very close to it. The tree roots cracked the fence and could have eventually caused serious damage to the wall. 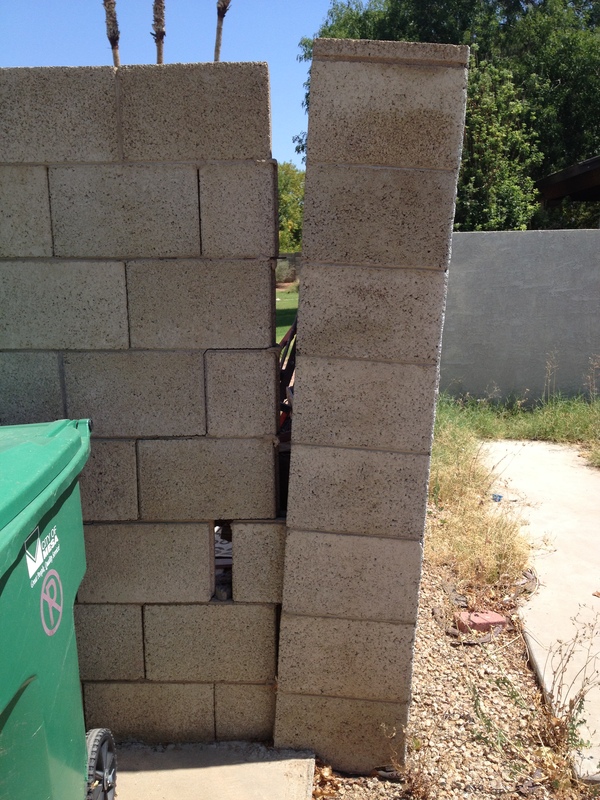 In this case ,The homeowner had the tree removed and called us in to repair that part of the wall. This was all that was needed to prevent further damage. Below are some Photos of a recently completed Custom Home project in Paradise Valley Arizona. This Project combines retro Slump Block with a Modern design for a really cool look. This home presented some challenges for us. The Raked (sloped) walls and the two massive gas Fireplaces with Herringbone patterned block were the toughest part of this job. This is a custom curved seat wall and radius fire pit that we built for a contented customer in Gilbert Arizona. The General Contractor was The Bruce Gardner Company. Custom cutting the Travertine Tile to allow for the curve of the bench and fire pit walls was a quite the challenge. We applied Veneer stone to the face and back of the wall for a great look! The seat back was stuccoed with a brown mortar. Notice that the Travertine has a bull nose finish on the edge for comfort and style. This is the radius fire pit wrapped in veneer stone with a custom fit Travertine top. it is now ready to receive the gas insert. The homeowners also extended their Patio so more columns were added to support it. these were wrapped in Stone and Stuccoed. This Is a Custom Brick home that we are currently working on in Coolidge Arizona for Desert Dream homes. It has presented several challenges that we have had to overcome. The brick are layed in a “stacked bond” pattern and the top if the brick is saw cut to receive a steel top plate. The tolerances were so tight, that we had to use a tile saw for our cuts just to get them right. This is a Sound Barrier Wall that we built in Marana Arizona last week. It was 65 feet long, 14′ 8″ tall and made out of 12x8x16″ block that weigh just under 46 lbs. apiece !! We had some tired workers those three days!! 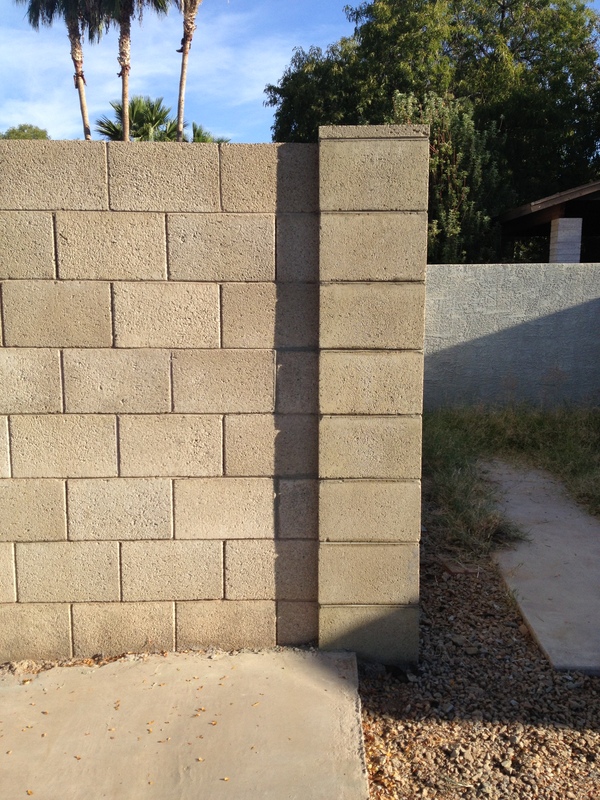 This is the “before” picture of a Fence block column that we repaired for a customer in Mesa Arizona. We found that the Column didn’t even have any re bar inside of it. Here is the “After” Picture. We epoxied rebar into the footing, and left our customer happy and content with a column that is stronger than it ever was.